Positioned two hours north of Los Cabos on the shores of the Baja Peninsula, the reef in Cabo Pulmo National Marine Preserve holds the distinction of being the only living coral reef in the Sea of Cortez as well as the only living coral reef along the western coast of North America. 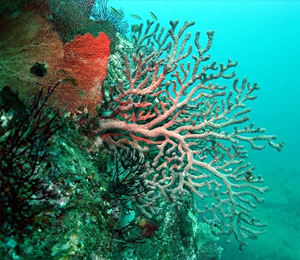 As a result of rare geographic conditions, a consistent water temperature of seventy degrees (Fahrenheit) is maintained in the Cabo Pulmo Bay which is a key factor for live coral growth. Novice divers and snorkelers will really enjoy the shallow area of the reef which is easily reached from the sandy beach. Experienced certified divers will appreciate the deeper more challenging dive sites in this region, many of which reach depths of seventy feet. There are many splendid dive spots in this region such as Mermaid's Beach, Roca de Jonathan, Islote (White Rock Pinnacle), Frailes Bay, El Bajo, Frailes Rock Sea Lion Colony, Eileen's Reef (Broccoli Forest Reef), Piedras Wohlford Reef, and the Colima Wreck. You'll have the chance to witness an amazing array of sea life, including the California Sea Lion, the Giant Pacific Manta, the Mobula Ray, four different Marine Turtles, Groupers, the Sergeant Major, the Yellowfin Tuna, the Pargo, Dolphin species, the Parrotfish, the Pufferfish, the Moray Eel, the Hammerhead Shark, the Reef Shark, Mackerel, Lobsters, Scallops, the Cabrilla, the Anglefish, Jacks and many other tropical fish.You may even see the biggest fish on the globe, the placid Whale Shark. You'll also discover countless different Corals, Sea Fans, Gorgonians and other astounding invertebrates.